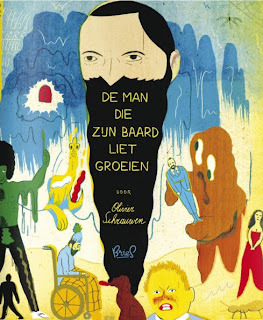 I had high expectations for The man who grew his beard by Olivier Schrauwen, but I wasn't prepared for how good it actually is - I hadn't expected to see a comic book like this so soon. We got lucky. It's a collection of short stories that are intertwined, because many share the same subject and discourse: a look into the minds of autistic, touchingly isolated men, their feverish inner worlds (rendered in many different techniques inspired by outsider art) and how these interact and contrast with their real environment. The book starts of great, and then becomes greater, digging deeper into it's subject, leaving you out of breath by the end. Because of it's subject and the concise, direct and honest way in which it is handled (Schrauwen does not repeat information, or cushion the strangeness of what is shown in some reassuring context), the book risks being tagged as 'surrealist' or 'absurdist', which sounds like 'random', while on the contrary I've never read a comic book that felt more careful and precise.